Thanks to today’s fast-evolving web technologies, it is easier than ever to create a memorable website. One of those technologies is parallax scrolling, which is often employed by different types of websites. In general, parallax scrolling involves the background scrolling at a slower speed to the foreground, which creates a 3D-like effect. This provides much-needed dynamics to WordPress websites, which is one of the reasons why we often see parallax integrated with WordPress themes. 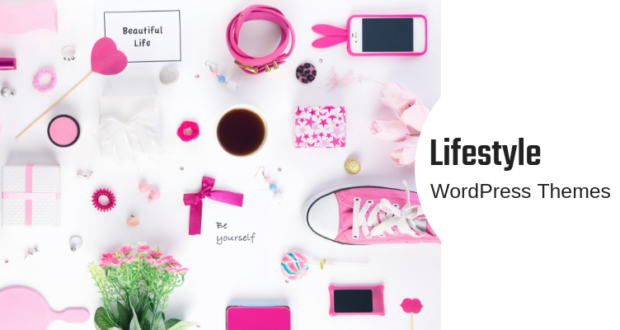 Below you can find our hand-picked selection of parallax scrolling WordPress themes. We’ll show you themes that are built around this technology, as well as themes that use just a small amount of parallax. So, without further ado, let’s get started. Create is a visually striking parallax scrolling WordPress theme that is built for both portfolio and corporate websites. It incorporates a high level of flexibility, making is possible to create different layouts and uniquely designed pages. There are five preloaded layouts to choose from when it comes to creating a portfolio. They combine full-width elements and masonry blocks that work great with parallax scrolling. 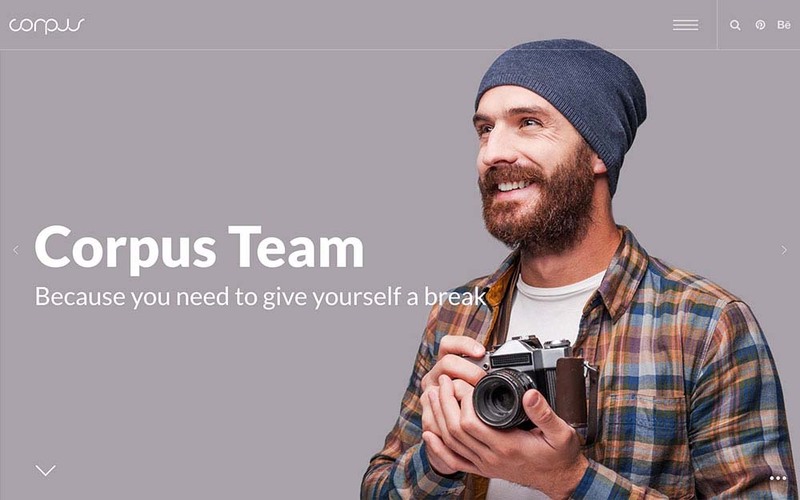 Subtle animations are also present which add a dynamic element to your page without being overwhelming. Corporate websites can also benefit from numerous interesting features. For example, there’s an amazing template for your company’s ‘About Us’ page, as well as an elegant Google Maps integration with the ‘Contact Us’ page. Thanks to the preloaded content, your website can be polished and ready for unveiling in a very short time. 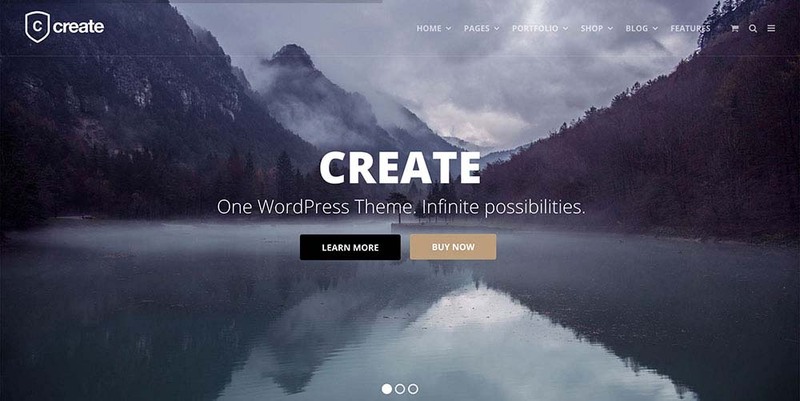 Create is a beautiful parallax scrolling WordPress theme. 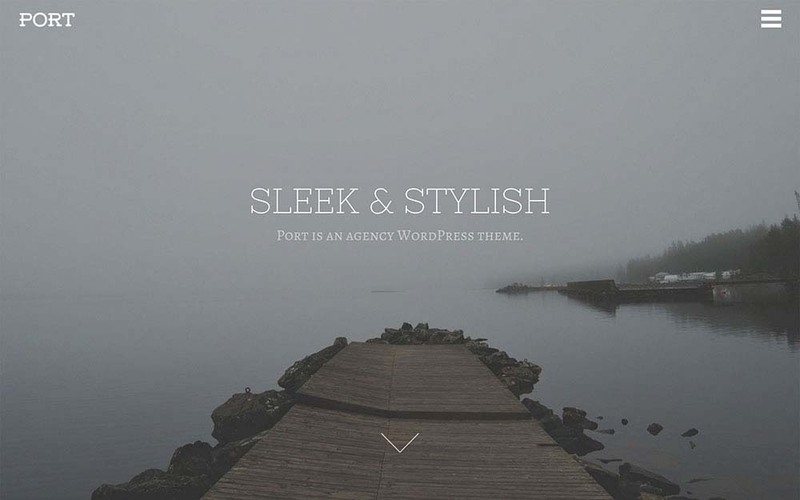 Story is a modern, responsive and clean-looking WordPress theme. It is designed for those looking for a modern corporate or personal page, with subtle parallax scrolling. 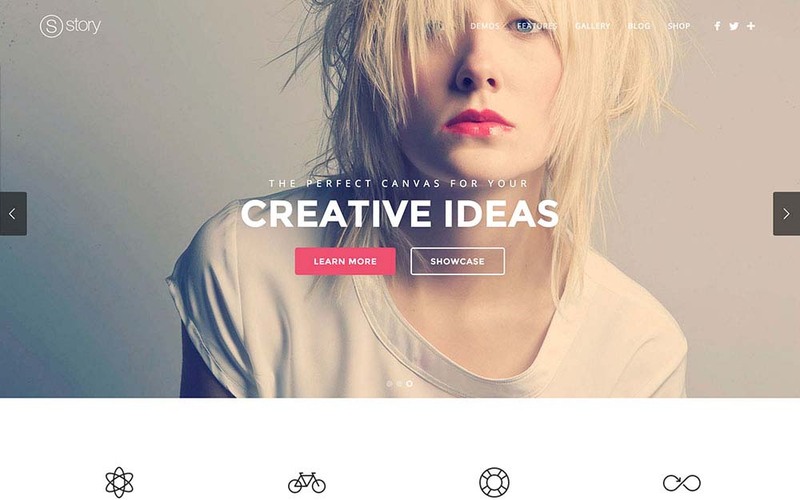 This theme can be easily adapted to different types of websites. 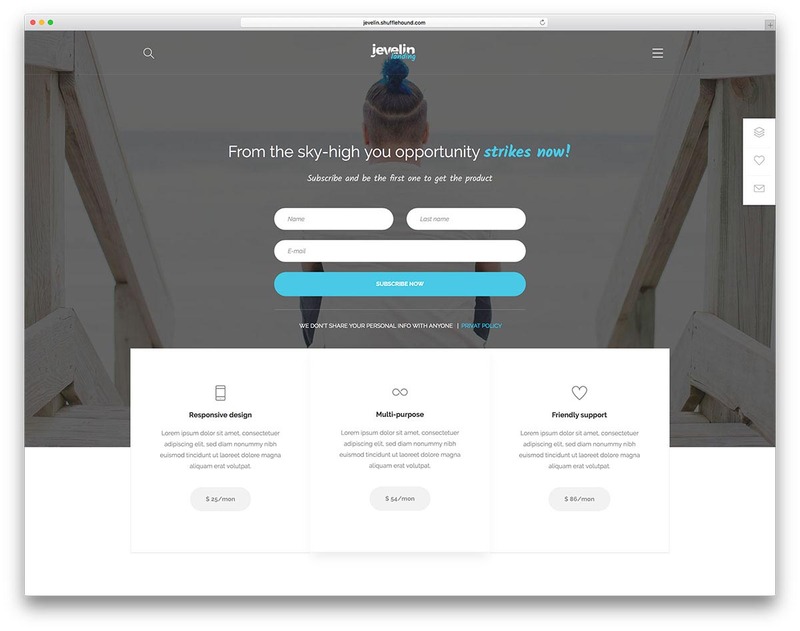 Some of the included demo pages can be used by freelancers, companies, and personal blogs. 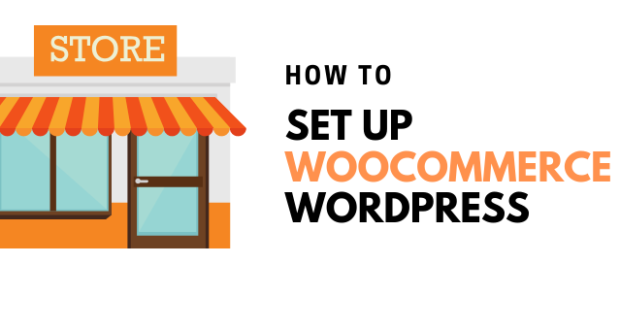 Story also incorporates WooCommerce, which means that you can open your online shop in just a few clicks. 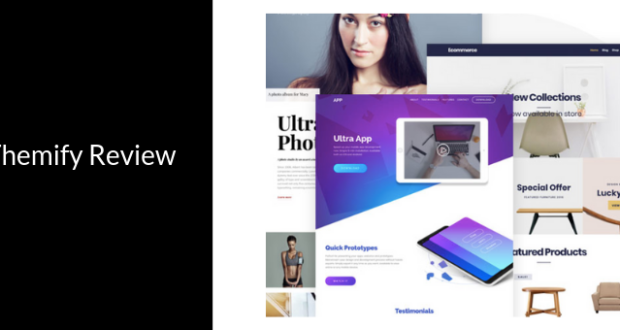 Some of the notable features of this theme are a fullscreen slider, advanced coloration, different types of galleries, and a range of preloaded pages. 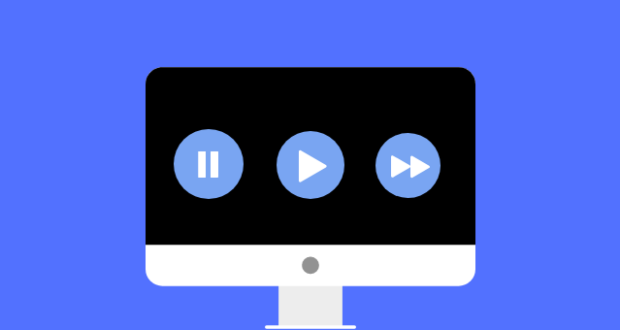 If you want to create your website from scratch, you can use the included Visual Builder with drag-and-drop content blocks. Corpus is designed to be lightweight in terms of its aesthetics and its code. However, this doesn’t mean that Corpus is a simple theme. In fact, a lot of work has been put even into its tiniest details. 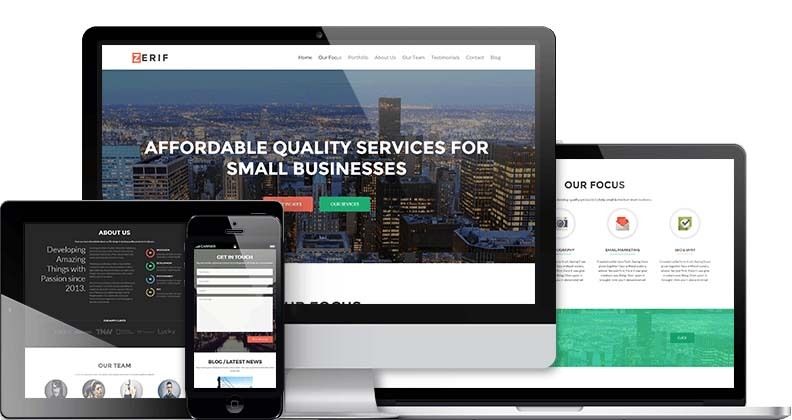 It is a beautiful and responsive corporate WordPress theme. 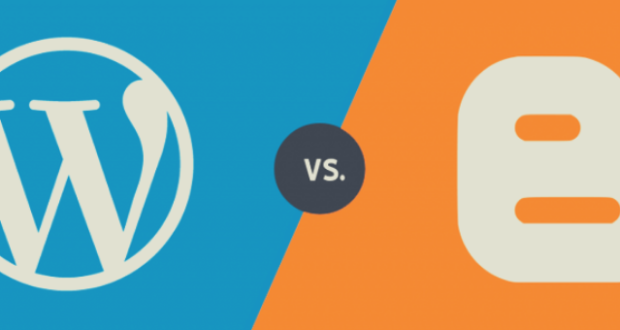 For starters, there are close to 300 theme options that allow you to fine-tune your WordPress website. This level of customization is something we don’t see often. You can play around with different header and footer layouts, as well as with preloaded content blocks. These include different types of galleries, typographic elements, sliders, and parallax scrolling elements. Finally, Corpus is very SEO friendly thanks to its clean code. This is an important prerequisite for a successful SEO campaign. Incredibly versatile and modern-looking, Rhythm can certainly meet your every need. 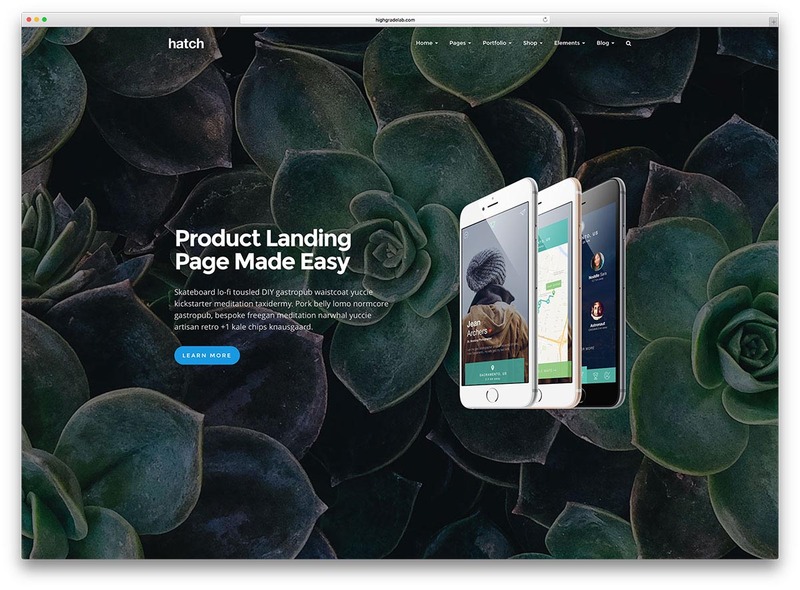 As its fully-loaded demos show, this theme can be used as a dynamic portfolio, an e-commerce shop, and even as a personal blogging page. You will get to choose from 175 web page templates with the theme’s classic Rhythm style. In addition, there are 90 templates with a new ‘Presto’ style. 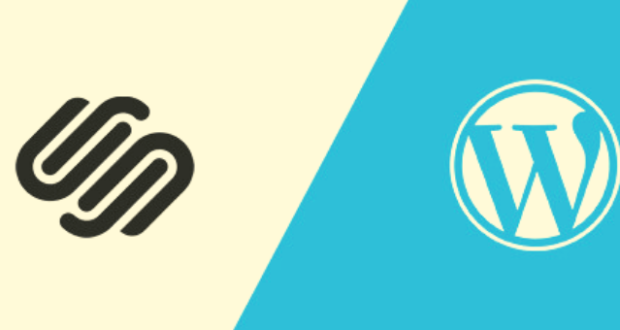 Thanks to the offered template pages, you can easily combine different styles into a uniquely designed WordPress website. It is also responsive, which means that it’ll look beautiful irrespective of the screen size. Creatives looking for a dynamic parallax scrolling WordPress theme will quickly fall in love with Rhythm. There are 40 different ways to showcase your work and services, including galleries and masonry grid displays. This theme employs a striking parallax scrolling that works without a glitch. 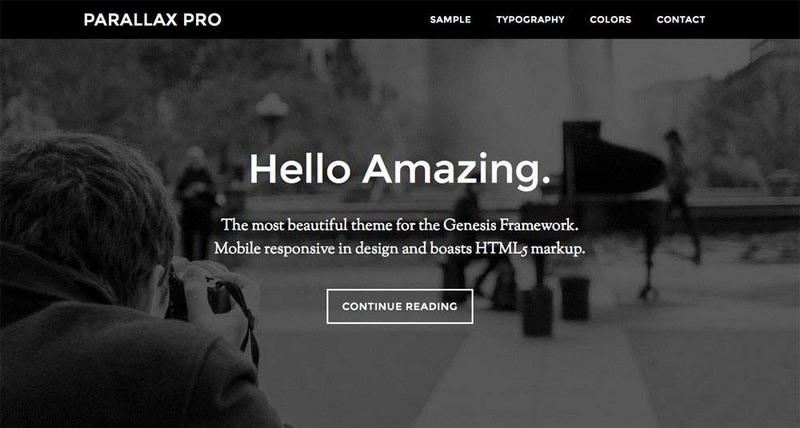 Zerif Pro is being marketed as the ultimate one-page WordPress theme for creative agencies. However, this seems to be an understatement. Upon installation, you will realize that Zerif Pro can be used to create almost any website. 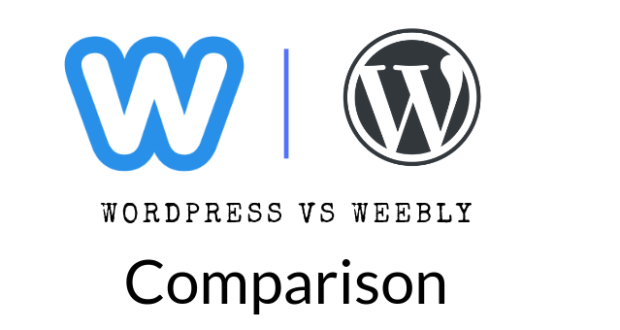 Even though there are close to 500,000 users of this theme, you can hardly find two Zerif Pro-powered websites that look alike. 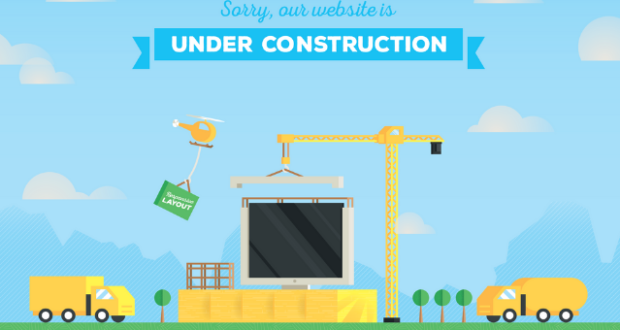 The reason behind this is the theme’s SiteOrigin Page Builder. This tool is used to create pages from scratch out of preloaded content blocks. You don’t need to have any coding experience. Instead, you can drag-and-drop content blocks and easily combine them using a column-supported layout. 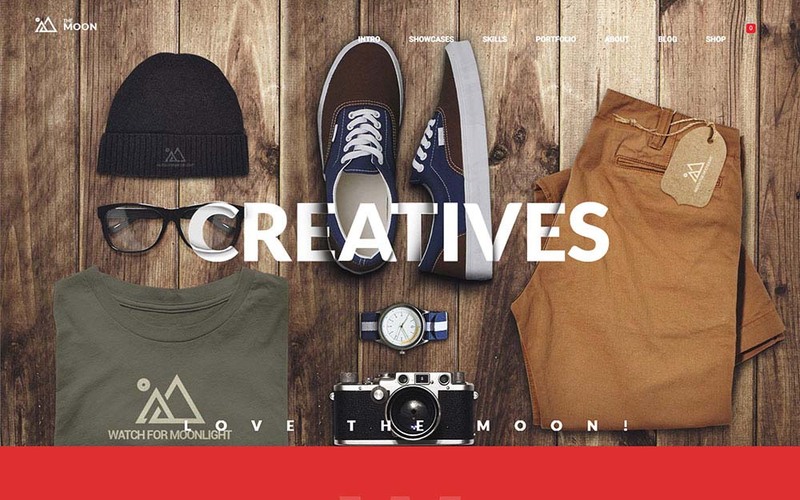 The Moon is a niche theme designed for creative professionals. To help you get started, there are four demo websites that can be imported in just a few clicks. Each of the preloaded demos offers a different portfolio type. Trust us when we tell you that you’ll have a hard time choosing which demo you’ll want to use since all of them are stunningly designed. The flagship feature of The Moon is the toggle blog/portfolio feature. This feature employs a simple animation that shows a preview of your blog post. Aside from being very functional, this eye-candy feature is the reason why visitors will remember your website. When it comes to parallax scrolling WordPress themes, The Moon is certainly one of the shiniest examples. 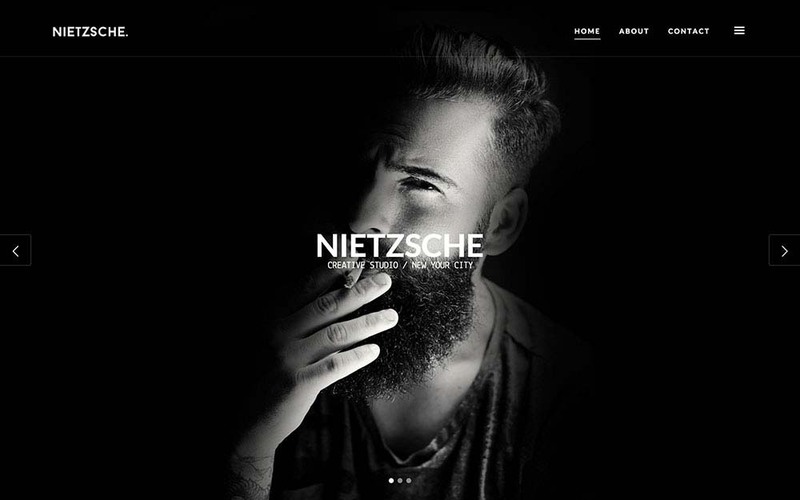 Those of you looking for a minimalist WordPress theme with a simplified UI should pay close attention to Nietzsche. This is a very simple theme in its heart, but also a highly capable and striking one. There are two demos to choose from which feature a big full-width header image, followed by the portfolio section. Nonetheless, there are different portfolio layouts, so you can decide which one displays your work the best. There are two types of grids – uniform and creative. Each of those offers clickable sections that open a new page and include embedded video or a slideshow. Nietzsche doesn’t come with hundreds of customization options, which shouldn’t be taken as a bad thing. Instead, this is a very powerful theme that lets you showcase your work the right way. Upon taking a glance at Patti, you will realize that we’re staying in the realm of minimalist themes. This parallax scrolling WordPress theme is built upon a fast-performing 3D-like effect. 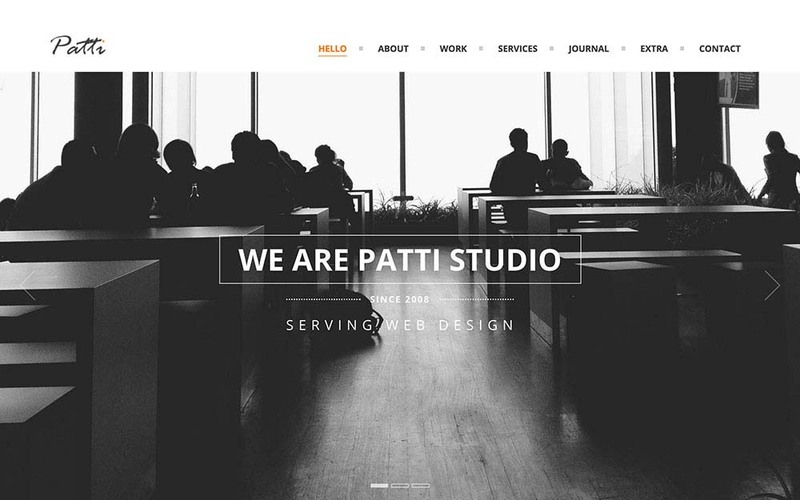 Patti lets you do more and showcases your work without spending a lot of time on customization. For example, when you create your portfolio, you will see an interesting color effect to each image you upload. This quick animation is what sets this theme apart from the others. It is clear that this theme is designed for those of you who like minimalist and flat design. It packs a very smooth parallax scrolling, simplified color combinations, and a stripped-down aesthetic. Don’t hide behind complex animations and showcase your work or products in a striking manner. As this theme’s name implies, Parallax is designed to showcase the full power of this scrolling effect. You can expect a colorful design, smooth animations, and a high level of customization. This theme’s demo showcases a colorful one-page design with an incredibly smooth parallax effect. 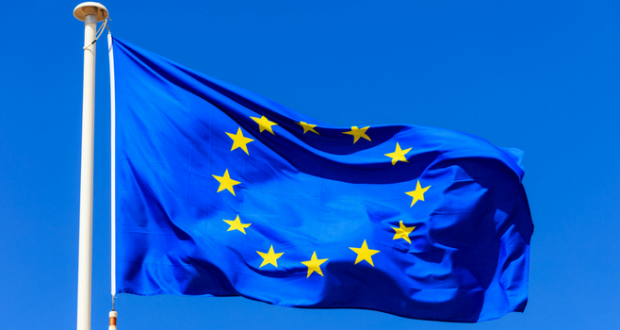 It is up to you to combine its content blocks into a uniquely designed page. You can choose from different galleries, sliders, boxes, quotes, and testimonials, as well as a couple of expandable portfolio displays. Parallax isn’t forgetting social networks either. There are 6 custom-made widgets where you can display your Twitter feeds or Flickr photo stream. When it comes to your blog, you can use an infinite scroll option to list all your posts without compromising the theme’s performance. Zoo comes in two different versions – standard and minimal. Both of them are designed to showcase parallax scrolling and well as a number of other animations. What is great about this theme is that you can create a highly dynamic website with no coding required. Another thing that’s unique about Zoo is that you can use tabs to display different post types. In addition, there is a built-in animation generator. This interesting tool allows you to animate different aspects of your website and to showcase your services or products. Among other interesting features are progress bars, preloaded content blocks, and expandable portfolio section. It is responsive as well! 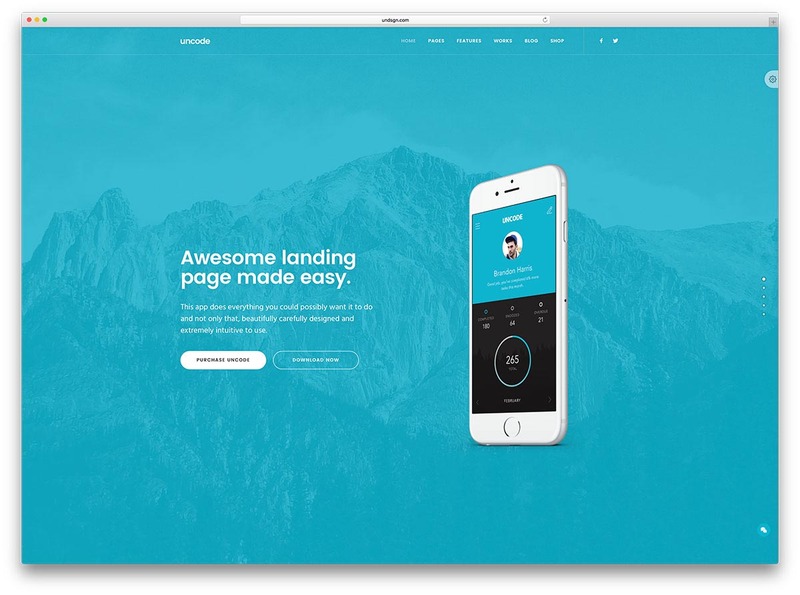 With Zoo, you can easily create both simple and complex-looking websites while avoiding to create an overwhelming design. 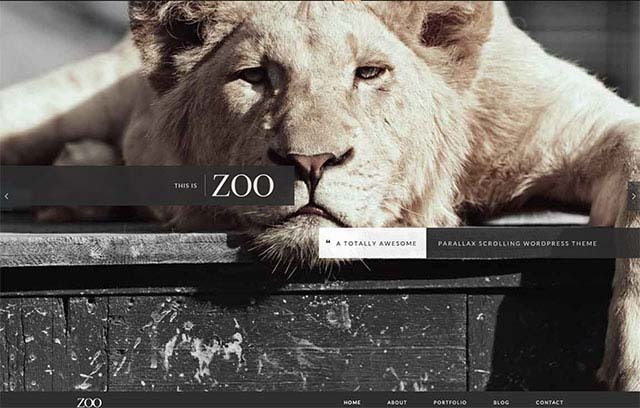 Finally, Zoo is as majestic and beautiful as a Lion parallax scrolling WordPress theme. With Jkreativ, you get a multilayered website that uses parallax to animate different sections of your web pages. If you take a look at this theme’s demo, you will see that it uses parallax in a big way. However, the scrolling remains fluid and smooth. This is not easy to achieve and you’ll be amazed by how smoothly everything works. 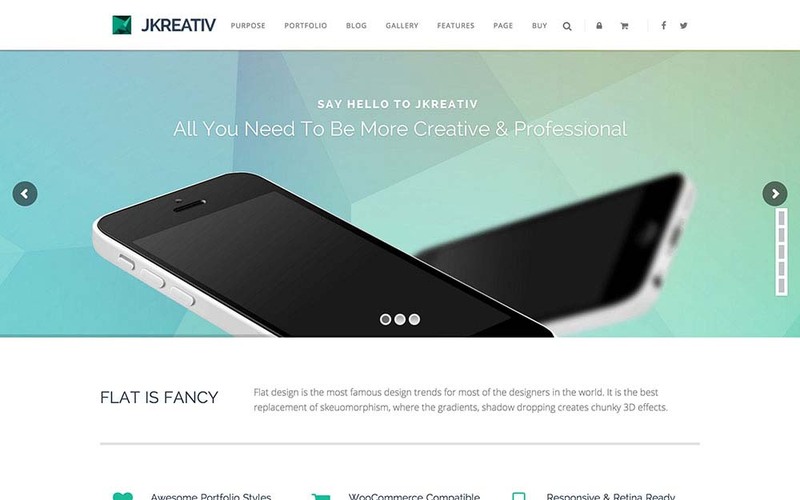 Jkreativ features preloaded content blocks, different post and page types, Slider Revolution, and the 360-degree image slider. 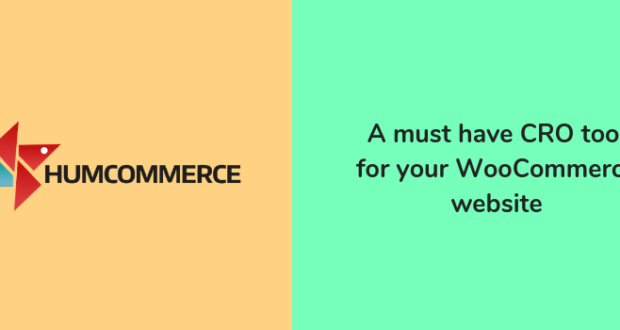 The theme is compatible with WooCommerce as well. Ronneby is a bold-looking theme designed for those who want to stand out. Upon taking a glance at one of Ronneby’s demos, you will be amazed by its numerous features. 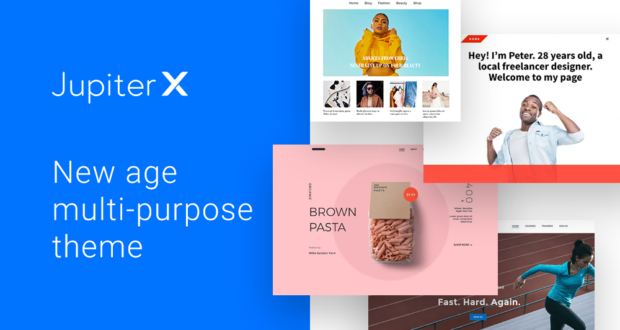 You will get to choose from 40 unique layouts for individual pages and elements, as well as more than a dozen of demo websites. An in-depth admin panel allows you to fine-tune different aspects of your website and to make it truly yours. 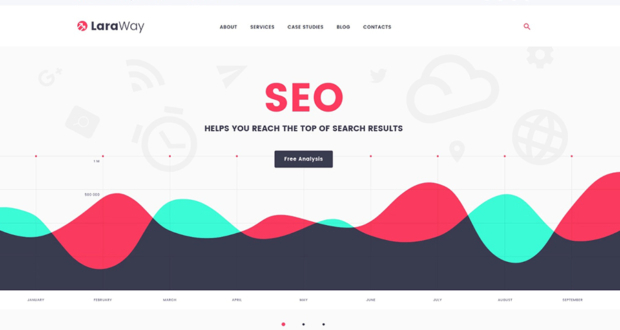 In addition, this theme provides numerous tools to create very striking-looking websites that capture visitors’ attention. Other notable features are 42 different portfolio templates and 13 blog page templates. 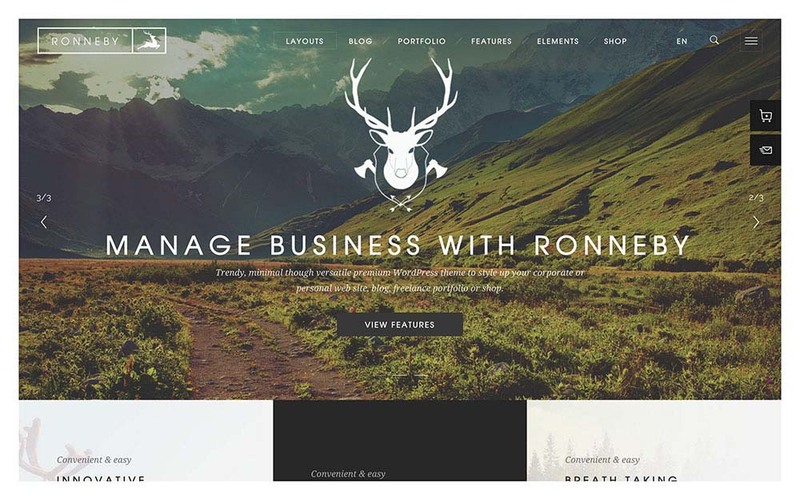 With this said, it is clear that Ronneby is designed for creative professionals and agencies. 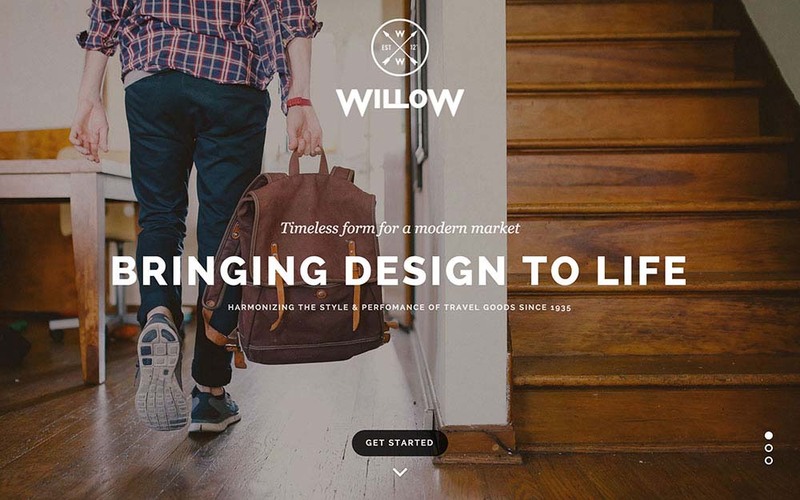 Willow is one of the scrolling parallax WordPress themes that employs fullscreen scrolling. As you can imagine, there are tons of interesting animations that power the fullscreen parallax scrolling. This theme truly shines through websites that use striking photography and illustrations in addition to bold typography. The scrolling is impeccable and all of the theme’s animations are quick, yet noticeable. 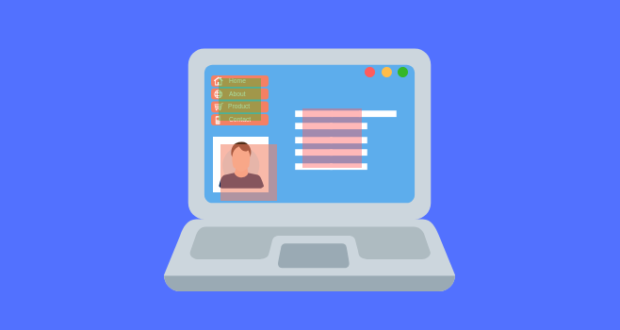 There is a number of different ways to animate your content as it slides into view while visitors are scrolling the page. 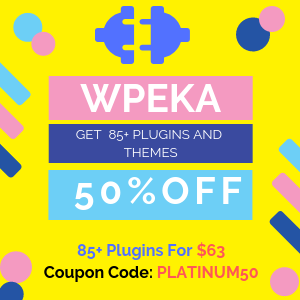 Other notable features are over 450 preloaded icons, plenty of shortcodes, different demo websites, and the Visual Composer tool. You will get all you possibly need to create a fully animated and fast performing websites. Port is a very interesting combination of fullscreen parallax sections and minimal look. Its design makes it great for websites that need to feature photos and different kinds of graphics. What is unique about Port is its navigation. The menu is hidden and can be accessed by clicking on the ‘hamburger’ button in the top-right position. When you click on this button, you will see that the menu slides out from the right. The menu can also host different widgets. When it comes to the main body, Port uses full-width elements by default. 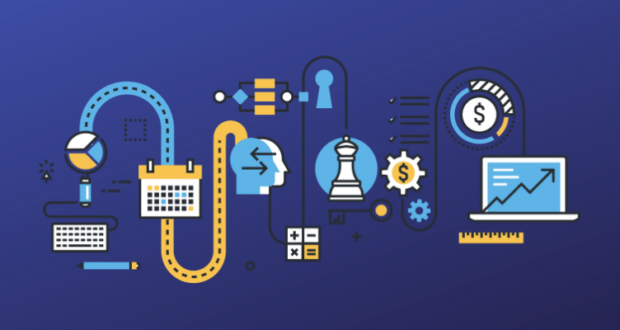 You can add different content blocks and easily integrate widgets, a filterable portfolio and other types of content segments. 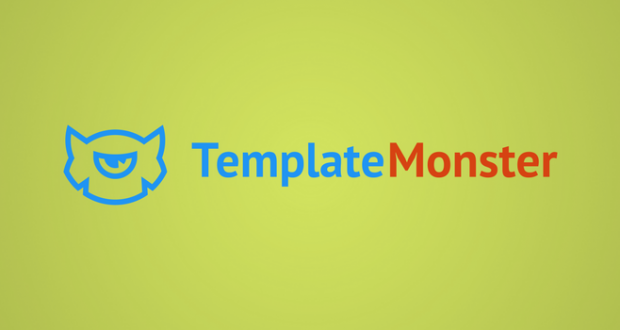 If you don’t have a lot of time to build your website, you can pick one of three premade templates. Parallax Pro is built on a custom-made Genesis framework, responsible for the adaptive design and fluid performance. Even though it is simple-looking, this theme is incredibly capable in its core. The theme comes with five premade color combinations – blue, green, orange, pink, and red. Aside from that, you can choose from different layouts and different typography elements. Parallax Pro is designed to look simple, but thanks to its complex layouts and bold typography, this theme can be visually powerful. Make sure to check out this theme’s demo to see different layouts and pre-made pages. However, also make sure to check out other pages built on this theme. You will see very interesting parallax effects and highly dynamic elements. 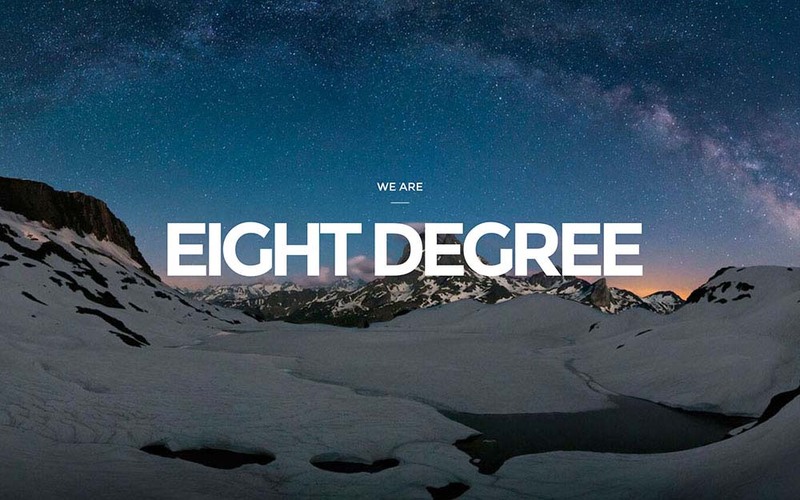 Eight Degree is a stunning and wonderfully simple parallax scrolling WordPress theme. 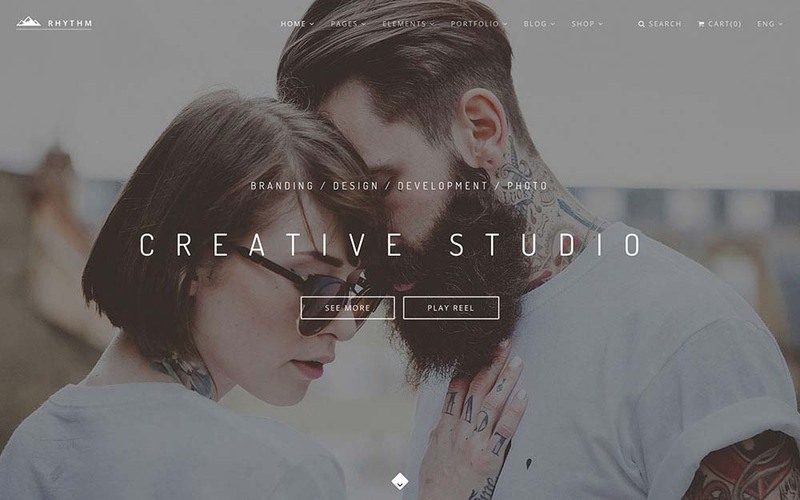 To use this theme, you need to have nice photographs that work well with lots of white spaces and bold typography. You can choose from 3 menu styles, 9 header options, 48 icons, and 99 Google Fonts. The theme is very flexible and can be used by agencies, creatives, and individuals. If you need to showcase your products or services, know that there are several filterable and expandable portfolio options. Needless to say, Eight Degree’s code is clean and prepared for an aggressive SEO campaign. You will get all the tools you need to build a memorable website and attract visitors. The amazing Revolution Slider is included for dynamic graphic elements, as the impressive Essential Grid that provides unique content layouts. Thanks to these versatile features, Hatch can be used to showcase mobile applications, books, as well as other kinds of digital services. Its features make it one of the best Landing Page WordPress Theme. 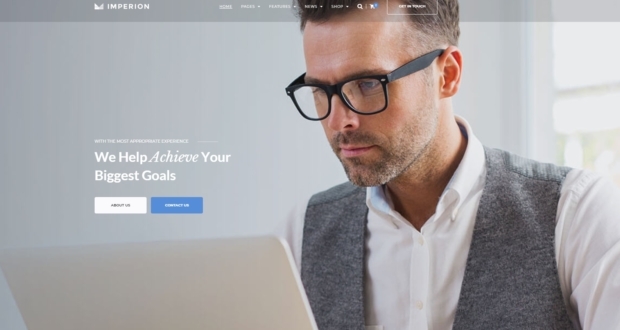 YOU is a premium one-page theme specially designed for business, ecommerce, portfolio, photography and other sites. It is purposely designed flexible with a versatile set of tools to create stunning websites of any nature. Its unique features are 3D and flexi pages. If you want to see the demo of the theme, you will be provided with 10 different theme demos, which are really good. 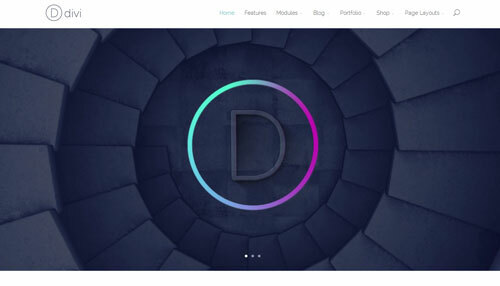 Divi is one of the most advanced one page themes of all time. It is a gorgeous WordPress theme that has single page as well as multi page layout making it a multi-purpose theme. The best feature of this theme is its, page builder. It is a block based visual page builder and editor that give the ability to create dynamic websites. 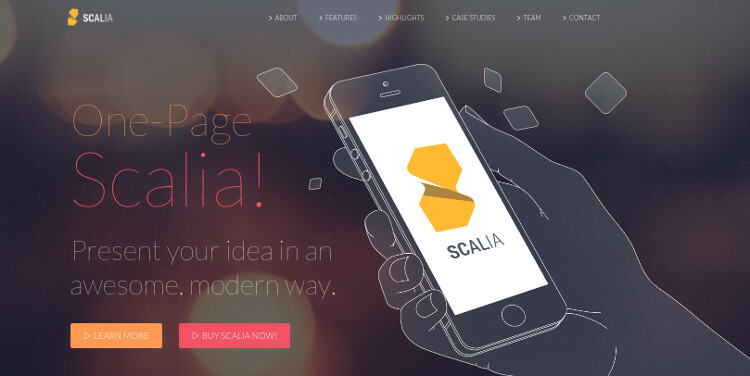 Scalia is a highly sophisticated and one of the best one page WordPress themes. It is best suited business and blogging websites. 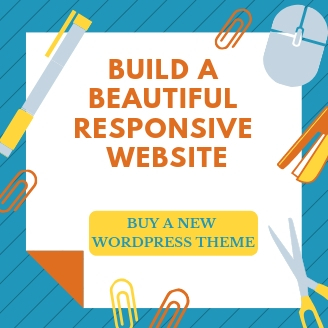 It is crafted with attention to details which makes it one of the most flexible and feature-rich one page WordPress themes. This multipurpose WordPress theme has over 150+ ready-to-use layouts. 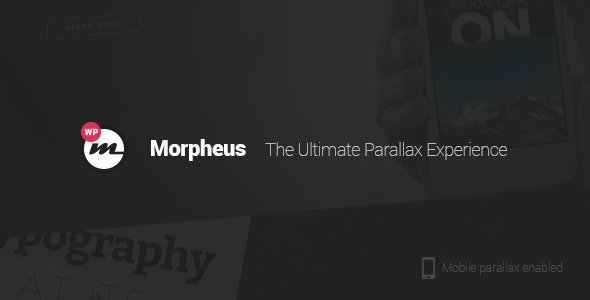 Morpheus is an amazing one-page theme to build an efficient and fast responsive one-page/multi-page parallax websites.It has awesome typography which will make your website look modern and awesome.This theme takes parallax to a whole new level. You can sliders, videos, patterns or images as parallax background with this theme! Easy shortcode customization makes customizing your website damn easy without much hassle. We hope that we helped you find the best parallax scrolling WordPress theme. There really is a lot to choose from, but you can’t make a mistake if you pick one of the themes from this article. 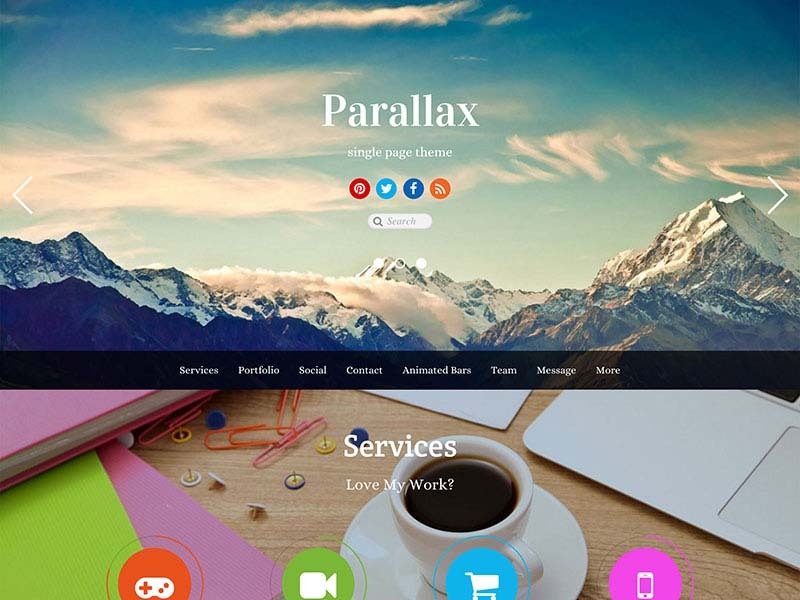 In case you’re fascinated with some other parallax WordPress theme, feel free to share it in the comments section. There are numerous hidden gems on the Web and we’d like to hear about them.